These days, it’s highly unlikely that pastry is what comes to mind when you think of Syria. 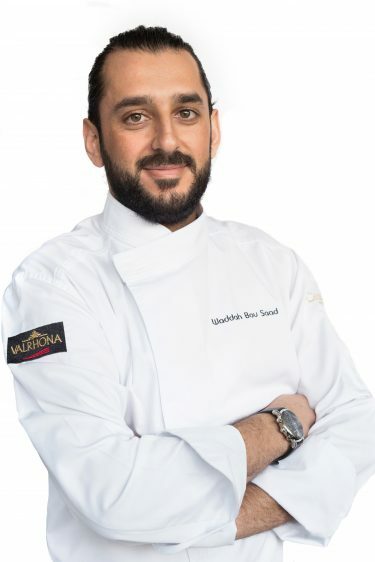 But for Syrian chef, Waddah Bou Saad, sweets are his motivation for happiness in life. 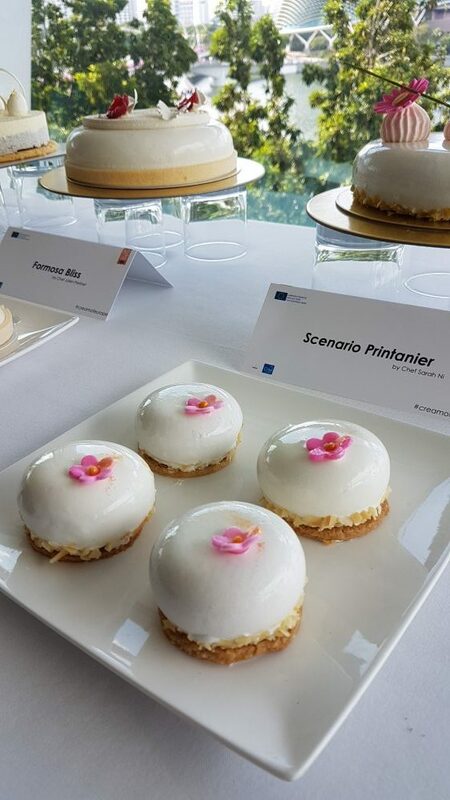 I had the honour of meeting Chef Waddah at a recent event organized by CNIEL – the French Dairy Interbranch Organization who have been promoting the use of European creams in a world-wide campaign. Billed La Crème de la Crème, the event was held on 15 June at Forlino and saw 10 chefs from around the world, including a fearless female from Saudi Arabia, whose interview I will publish over the next few days, present desserts on the theme “Blanc de Blanc”, highlighting cream as the hero ingredient. Only a sense of decorum prevented my grubby hands from blemishing these fluffy, white creations! Pretty please, with a pink bud on top? Chinese Chef Sarah Ni’s creation. This Jasmine-infused delicate creation by Chef Talita Setyadi from Indonesia was one of my favourites of the evening. 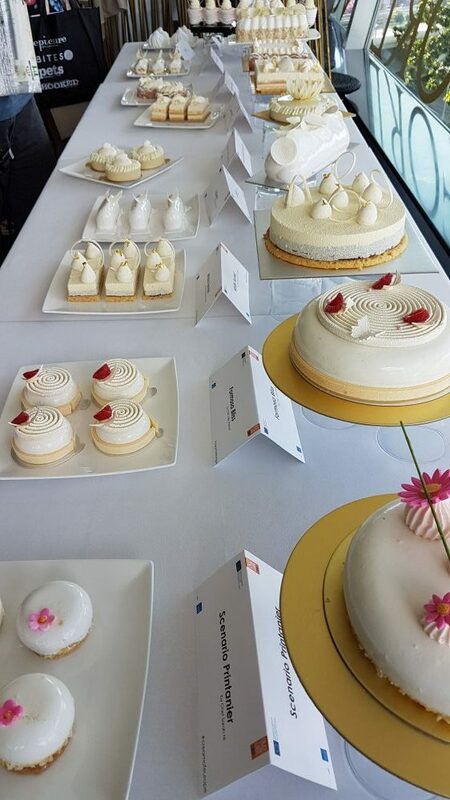 I was curious to attend this event, not only because I am a dessert junkie and wanted to learn more about fine European cream but because I had read that one of the chefs was Syrian. True, he isn’t quite raining sweets down in Syria, he is working in Dubai, UAE, but still, an opportunity to meet someone who left his war-torn country was one I couldn’t miss. Chef Waddah, by the way, left only in 2007, and makes frequent visits back home where his parents remain, so it’s not like this is all in the distant past for him. The question about Syria weighed heavily on my mind, but knowing that this was an event about all things light and fluffy, and assuming that the chef would not appreciate talking about this, I was doubtful as to whether I’d get a chance to even scratch the surface of the Syrian topic. But I guess it’s like cookies and cream (pun intended) – you can’t have one without the other. Likewise, you can’t have a Syrian in front of you without asking about Syria, can you? And Chef Waddah knows it, I guess. He brought up the topic before I even alluded to it. So after a couple of perfunctory gapes at the veritable white trove of creamy desserts on display, I sat down with Chef Waddah for a quick chat. 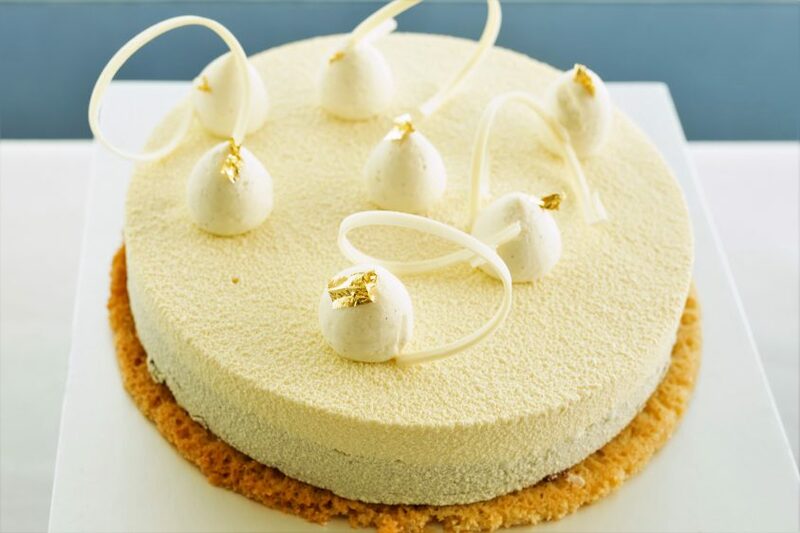 How did you get started as a pastry chef? I actually studied for 5 years to be an engineer, but what I always enjoyed was cooking with my mom. And especially making pastries. I love to draw and create art so pastries are a great way for me to express this side of myself. What kind of pastries do you enjoy? I love Arabic sweets, like baklavas. But they are really sweet and that’s why I like experimenting with mixing east and west. Eastern ingredients with Western techniques like French techniques. I might do a halwa-based ganache, for example. I also love chocolate and I like to add in dark chocolate to temper down the sweetness of some of my pastry creations. What about your family – are they based in Dubai too and are they into the culinary scene as well? My brother and sister are in Dubai but my parents are still in Syria. In the Sweida region. This might sound like a silly question but are your family members in Syria interested in pastries and sweets? With all that’s going on, I’m guessing this isn’t something that’s the top of their mind. Actually, it is not a silly question. The war has been going on for 7 years, we cannot live our life always being afraid. We are human, life has to go on, doesn’t it? Yes, if there is one thing I am sad about, it is what is happening there. Personally for me, my career in Dubai, everything is okay. But of course, the situation in Syria makes me sad. The region my parents live in is okay. In fact, I am flying off tomorrow to visit them. Sometimes it’s how the media portrays it and what people read. But it’s not always the whole story. There are still new restaurants opening and so on where I live, so yes, people are still living their lives as normally as they can. Do you ever see yourself opening a shop in Syria then? Well, I have dreams to open up a pastry shop somewhere, but not till I have gained further experience in how to run a business and so on. Currently I am a chef consultant working with a top restaurant executive in Dubai. We consult for other restaurants and food businesses. What do you enjoy about your work and what do you find most challenging? I like that I get to have new experiences, and love the creativity. I like working on new concepts. The challenges come from learning how to deal with people with different expectations and ways of communicating. But I suppose that’s the same challenge in any business. And how has your visit to Singapore been so far? Singapore is amazing! I really like it. This is my first time here and I would like to come back one day. I am here for such a short time. The place is wonderful and the people are very nice! 8. 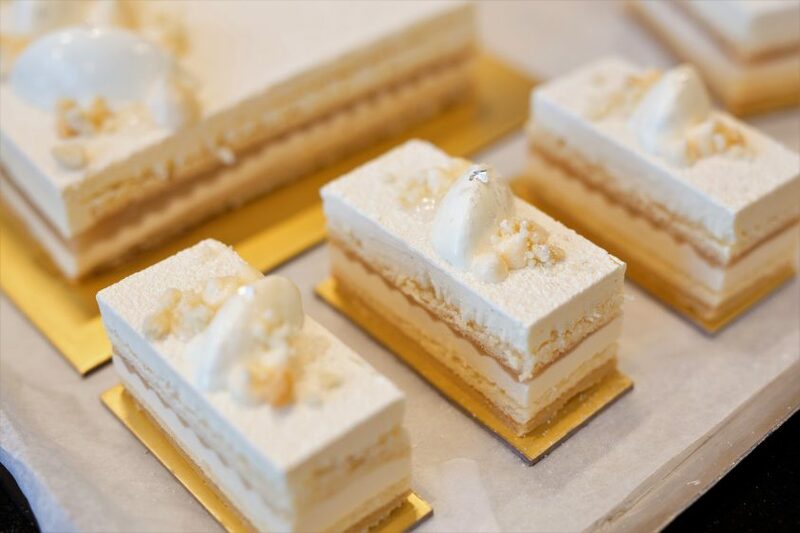 So, can we expect an opening of your pastry shop in Singapore someday? Yes, why not! When the time is right and I have the right experience, why not? !